Woodcutting is not only one of the oldest relief-printing techniques but also one of the most versatile. Discover your creativity while cutting linden wood and let our expert instructor Christian Thanhäuser inspire you to experiment with the carving knife. Find a new and often amazing perspective as you play with light and shadow in this fascinating and relaxing craft. At the end of the course you will be proud of what you've created. And if you need a beautiful postcard or a special gift in the future: Your works can be reproduced again and again! "It was a brilliant course, unbeatable. Many thanks, especially for your personal attention!" "Great teaching and support from the course instructor, who encourages you to do your own experiments." "The workshops are very well equipped and provide a good atmosphere." "Professional standard and plenty of opportunity to ask questions and get constructive answers." Of course we provide all the tools necessary for the course. And you will also have the opportunity to try out our complete range of tools while you're there. With Christian and Ludwig Thanhäuser. 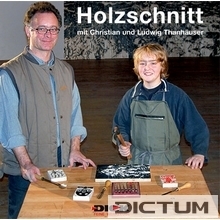 In this instructional film, Christian Thanhäuser teaches all aspects of woodcutting, from the first sketch right through to the printing on Japanese paper. His 11-year-old son Ludwig already works on large formats and cycles and shows how easy it is to use carving tools and how much fun it is to play with light and shadow.